Being among the first in the regulated online poker market, WSOP.com NJ is setting the bar very high. Combing robust interface behind the 888 Poker gaming experience and exciting promotions behind the World Series of Poker brand, it is no wonder that the site has become a premiere destination for New Jersey & Nevada online poker action seekers. The No-Limit Holdem tournament and cash game scene is vibrant with a variety of action across all stakes at any time of the day. Participation in SNGs and poker variants like Omaha, Stud, and Razz, although lacking the traffic levels currently seen in NL HE, are also gaining strength. The site also boasts a very friendly rewards program, something they call Action Club where players can progress through four monthly and two yearly tiers to receive up to 30% rakeback and cash rewards for the Action Player Points they earn. This is not overlook the fact that, for the first time in history, U.S. poker players can enjoy their favorite game knowing that it is offered by a home-based provider, with all the security and piece of mind that it brings. The website got started, together with several others, as part of a state-wide online gaming launch on November 26, 2013. WSOP.com NJ & NV is owned and operated by Caesars Interactive Entertainment. 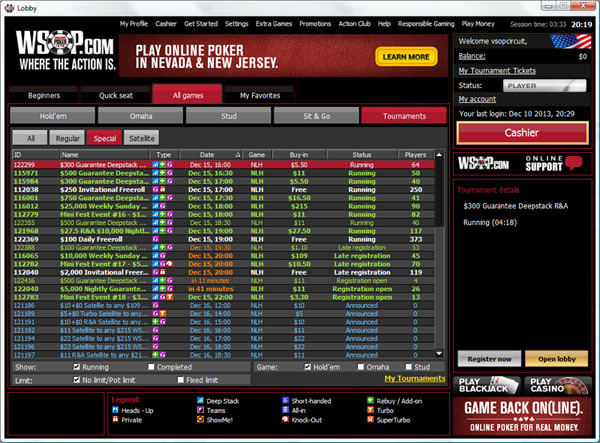 The software used by WSOP.com was provided by 888 Holdings – the same engine that powers 888 Poker’s international network is shared by WSOP.com. As cream always rises to the top, it did not take long for the site to assume leadership in the industry attracting hundreds of cash and tournament players daily. Deposit methods include Bank Transfer ACH (also a cashout method), and VISA and MasterCard credit or debit card. VISA and MasterCard methods cannot receive cashouts. WSOP.com is also planning to introduce an option to make deposits and withdrawals at Caesars Entertainment brick and mortar casinos. All transactions and personal financial information are completely secure as WSOP.com uses the most advanced security and encryption technologies available. The WSOP.com user interface was developed more than a decade ago and has certainly passed the test of time. Brought to the table by 888 Poker, it has all the main features typical of a mature poker client, plus it has several unique ones only found at 888 online poker rooms. The lobby is rendered in classic “casino” colors – red and black being main ones – but, somehow, sharp contrasts are avoided and it is very easy on the eye. Lobby has one-click access to all of the action, options, settings, and features, and yet, it does not seem crowded and is easy to navigate. After logging in, you can open the lobby in one of the four views: Beginners, Quick Seat, All Games, and My Favorites. The Beginners view displays available micro and small stakes cash tables, SNGs, and tournaments, which those either new to the game, or new to the software should find very convenient. 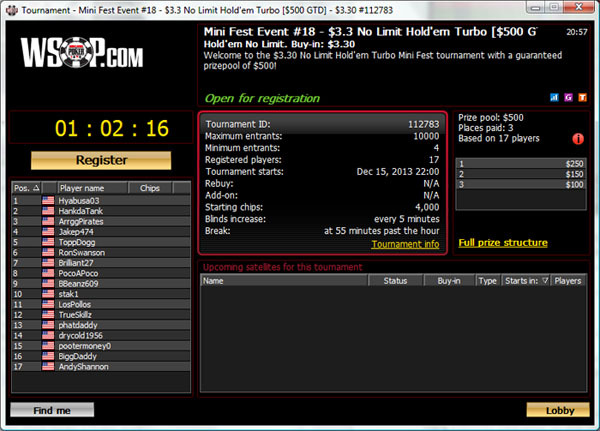 Quick Seat is a customizable view that offers currently active cash table and tournaments and a set of basic filters. All Games is, just as the name implies, a menu of all action with all available filters and tabs. My Favorites view lets the user set stakes and game types according to their own preferences. Once you’ve applied all the filters, this would be the only screen you’ll ever need to get to all of your favorite action. Each game on any of the above views, except Beginners, will be represented by one line. Beginners view has a button for each game. Double-clicking on the line will display game detail screen, from where you can join the table or register for the tournament. Several table and deck designs are available under Settings, which also allows to choose or upload your avatar and select game setting and effects. Variety of other features are also accessible from Lobby: profile, cashier, strategy tips, help, casino, promotions, rewards, responsible gaming, and play money – everything is at your fingertips. All in all, the poker client is implemented according to the highest standards, rivaling or exceeding the industry’s best. The interface is glitch-free, intuitive, and easily navigable: transitions from screen to screen and refreshes occur instantaneously making for a very enjoyable playing experience. Currently being only able to accept players from one state, WSOP.com is still able to attract reliable traffic in the NV and NJ markets. Tournament registration is regularly in the hundreds for most popular tournaments, and cash game action takes place at several dozen tables virtually at any time. With the abundance of freerolls, this type of tournaments is, understandably, the most popular MTTs, but select regular tournaments can also attract sizeable pools and reach thousands of dollars in payouts. Promotional events are also a big draw. For example, the inaugural New Jersey’ Next Poker Millionaire tournament in December 2013 boasted nearly 2,000 participants and paid cash prizes to nearly 400 top combatants. Keep in mind that you can only login and play against users from the same state that you are in, so traffic levels will vary from state to state. The WSOP site is in its infancy, but typically plays host to some pretty soft cash games. This is likely due to recreational US players easily being able to deposit and play legally. As more and more casual players begin to flock in, tempted by the well known WSOP license, the overall skill level should get weaker and weaker. By signing up through FTR, you will receive an exclusive First Time Deposit Bonus of 100% up to $400! No code required if you are using one of our links. In addition to the bonus, you will also receive seven tickets into special freerolls. To clear the WSOP.com bonus, you have to earn it by playing real money games at their poker room and collecting Action Player Points (APPs). For every 100 APPs earned they will release a $10 bonus repeating the process until your initial deposit (up to $400) is matched. You’ll have 60 days to clear as much of the bonus as possible. The customer support at WSOP.com will meet the highest expectations. Their customer service advisers are available 24 hours a day, seven days a week by phone or email. Support is also available by fax or mail, providing customers with many different alternatives. Lastly, if you’re a do-it-yourself type, WSOP.com provides a FAQ page, accessible from Lobby under Help, with abundant details on practically any issue a player could face. For an extra piece of mind, there is even a grievance process, designed to address situations when the service received was not satisfactory or an issue was not dealt with properly. In those rare cases, a formal complaint can be made in writing, to complaints@WSOP.com.